sum up of the wedding vibe: A rainbow-inspired, disco spectacular with a meaningful feminist foundation. Booze and Food. The space was actually pretty affordable but did require that we used their bar and restaurant for the event. It ended up being worth it since it included their staffing as well. Booze is expensive, but we knew we wanted an open bar. We definitely spent more than expected on decor and rentals! While the venue itself is quite over the top, we definitely had to spend some money to transform the reception space and add personal touches to cocktail hour. Our outfits. I was able to find my dress at Nordstrom for about $300, and it didn’t need to be tailored! 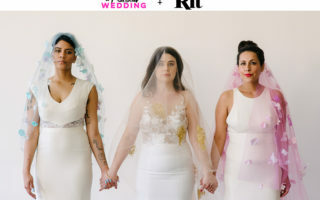 It seems like you can save a bunch of money just by finding a dress that’s not labeled a wedding dress. A great photographer and a videographer. It was truly the most magical day and it went by so fast. Having the memories captured is absolutely priceless. I worked so hard on all the details, and I really didn’t get to appreciate it all on my wedding day, so being able to see it all was so important. I also felt like the money we spent on the event itself was totally worth it. (Ideally) you only get married once. This was our big event, and I did not regret going for it! It was also completely worth it to have a month-of/day-of coordinator. My friends and family got to sit back and enjoy the day without stressing about set up or anything else, and I got to be the bride and soak it all in. For me, hiring a planner/designer to help throughout the process was not worth the cost. Having someone to help out the month- and day-of is absolutely vital (in my opinion), but I ended up doing most of the design, vendor research, decor sourcing, and planning for the wedding itself. I feel like it would be worth it for folks that don’t have experience planning events or who might have a larger budget that the planner can just go to work with. Reaching out to friends who were also planning a wedding at the same time was really helpful. It was fun to talk about details and laugh at crazy family antics. Other people aren’t in wedding planning mode, so it’s nice to geek out (and vent) with someone who gets it. It was also extremely helpful to have parents that let this be our event. Neither of our mothers tried to insert themselves in the planning, forced us to invite family friends, or judged our choices. It was very very appreciated. Finally, it was very helpful to not rely on homemade crafts. I did attempt a few DIY projects but was prepared for them to fail, and I was pleasantly surprised when they worked out. I feel like it would have been extremely stressful to feel responsible for making a lot of things. If I could go back and change anything, I would have opened a checking account specifically for the wedding in the very beginning of planning. Between my husband and I moving money back and forth and money coming in from different family members, I never knew how much money I actually had to live life during planning! I also would have used a budgeting app to keep track of everything. It felt so perfectly us. From the heartfelt (yet cynical) vows, to the wacky venue, the colorful decor, and the epic dance party, it was a hundred percent Scott and I. Since decor was such an important piece of our wedding, we didn’t have a huge budget, and we had a lot of space to cover because we used different spaces for the ceremony, the cocktail hour, and the reception, we really had to get creative. We made sure to repurpose certain decorative pieces throughout the event. For example the floral arch used to frame the ceremony was moved downstairs to decorate the area around the sweetheart table. Flowers are expensive, and this really saved some money! Another thing that helped was to rely on things that were provided by the venue to help minimize costs on the specialized things I wanted to include. 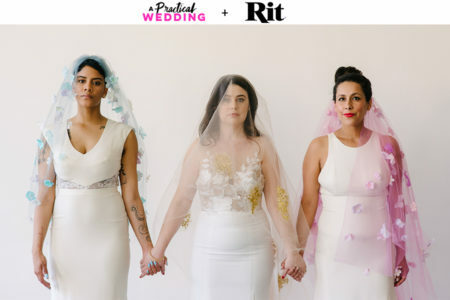 I really wanted to rent iridescent glassware but realized that it wouldn’t be worth it to use them during the reception since it would be pretty dark. We used the glasses that were provided by the venue for dinner and rented a small amount of the iridescent flutes for the cocktail hour that was outside. Additionally the DJ charged extra for more than two spaces so we just used the PA system provided by the venue for the ceremony and had a friend play the piano so we didn’t have to have the DJ set up in that space as well!